Antimicrobial textiles have attracted a great deal of interest in recent years due to their potential for reducing the transmission of infection in medical and healthcare environments. Antimicrobial properties can also improve the performance and lifespan of consumer products, and so these fabrics are increasingly finding applications in the wider textile and apparel industry. This book provides systematic coverage of the technologies and materials required for developing these important textiles. In Part One, chapters address key issues and technologies in the creation of antimicrobial textile products. Topics covered include testing and regulation, microencapsulation, sol-gel coating and plasma technologies, nanotechnology and life cycle assessment. Part Two then reviews key antimicrobial agents, such as N-halamines, plant based compounds and photo-active chemicals. 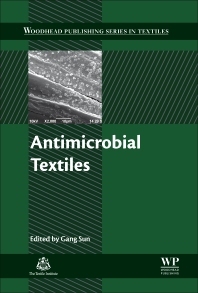 Finally, the chapters of Part Three offer detailed reviews of antimicrobial textiles for particular important applications, including medical devices, protective clothing and products with improved durability and longevity. Dr Gang Sun is Professor of Textiles and Clothing at University of California, Davis. Professor Sun’s research focuses on novel functional textiles and polymers and their human health and environmental impacts.